ARGHH! 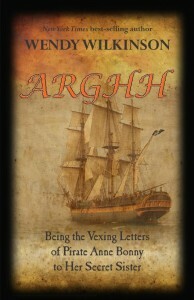 Being the Vexing Letters of Pirate Anne Bonny to Her Secret Sister by New York Times bestselling author Wendy Wilkinson, is now available as a FREE download from April 21 to May 20! This collection of “secret letters” stirs the seas for Wendy’s first full-length work of fiction Pirate’s Plunder: An Adele Bonny Adventure. In the pirate-inspired mind of the author, Red Rum Wendy (Wendy’s pirate name), historic (real) pirate Anne Bonny confided to her younger sister about her three year pirate life with her lover, Captain Calico Jack Rackham, where she revealed her deepest secrets, chronicling their illegal adventures, pillaging and plundering throughout the Caribbean.